Have you ever met anybody that cringes about the idea of having anchovies on their pizza? Well I actually belong to the opposite category of consumers. I absolutely adore seafood in every form and shape. The sharper the taste is, the better. I used to be somewhat puzzled by customers when I was working at a restaurant , when they would return seafood plates back to the kitchen, because in their opinion it was "too fishy"...well, isn't what fish is supposed to taste like? I guess my palate is not as refined. I recently also discovered great benefits in eating seafood for a lot of different reasons. Sardines definitively fall into that category. Forget your daily does of vitamins, these little wonders are rich in vitamin B12, selenium, omega-3 oils, protein, phosphorus and vitamin D. Basically what that means is cardiovascular health, memory, joints, skin and energy levels. Today, with this recipe I'll upset a little bit the nutritional value, because I will fry them, but once you try just one, you'll understand my weakness. First of all you have to butterfly and clean your sardines. Just start from the head and pull slowly until all the innards will come out. Secondly, butterfly slowly the small fish and take out the bones with your fingers. Once you have cleaned up all the sardines you need to beat the eggs, adding the salt and pepper to the mixture. Next dredge all the sardines in the egg mixture, and on a different plate, coat each sardine on both side with breadcrumbs. Take each breast flat open and lay a slice of ham and a slice of cheese of top. Next roll slowly each breast and try to use more than one toothpick to hold the roll firmly. Please make sure you advise your guests to be careful about the toothpicks when they will eat the breasts! Next, we will melt the butter in a nice large pan and lay all the rolled chicken breasts. 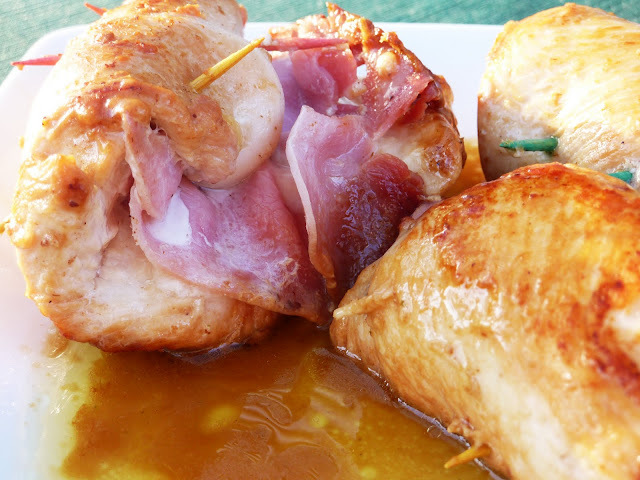 To enhance the flavor it is recommended that the chicken gets that brown, caramelized color uniformly all around it created from the butter. After the breasts are brownish all round, top the chicken with the white wine and put a lid on top of the pan, leaving a little opening. Let cook for about 15 minutes on slow-medium fire. Serve warm with a nice white wine. This dish pairs up really well with mashed potatoes.